DataOne Software, a division of Dominion Enterprises and a leading provider of vehicle content and automotive data solutions, today released its new VINBasicTM Trailers product. VINBasicTM Trailers expands DataOne Software’s industry-leading VIN decoding solutions to cover the US trailer market. DataOne Software, a division of Dominion Enterprises, today released a case study detailing how its OEM-recommended service schedule data has helped DealerSocket’s dealer clients increase their average number of service appointments and dollar value per repair order (RO). 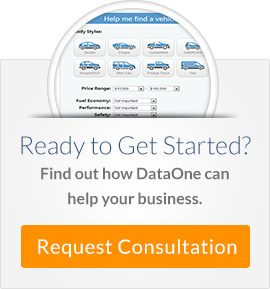 DataOne Software is a leading provider of automotive vehicle data and software solutions. DataOne Software, a division of Dominion Enterprises and a leading provider of automotive data and software solutions, today launched its Kelley Blue Book® Values mapping product. With this launch, businesses utilizing both DataOne and Kelley Blue Book can seamlessly access the most up-to-date new and used-car value data by VIN. DataOne Software, a division of Dominion Dealer Solutions and a leading provider of automotive data and software solutions, today announced an agreement with Hyundai Motor America to license Hyundai and Genesis Build Data within its products, including its VIN Decoder API web service. With this addition, DataOne’s customers will be able to access VIN-specific, window-sticker-level information for Hyundai from model year 2010-present and for Genesis from 2016-present. DataOne Software, a division of Dominion Dealer Solutions and a leading provider of automotive data and software solutions, today announced the availability of Mazda Build Data within its VIN Decoder Web Service. Inclusion of this data will allow DataOne’s customers to accurately identify and describe all Mazda inventory by VIN from model year 2010-current. DataOne Software today released a case study detailing how its extended vehicle data has contributed to AutoWeb’s successful vehicle search and configure website, driving a growing number of website vehicle searches each month. DataOne Software is a division of Dominion Dealer Solutions and a leading provider of automotive vehicle data and software solutions. DataOne Software today released a case study detailing how its consistent, timely and accurate vehicle data and VIN decoding provide a foundation for Xtime's thriving customer retention products that have helped the company penetrate the Canadian market. DataOne Software is a division of Dominion Dealer Solutions and a leading provider of automotive data and software solutions. DataOne Software, a division of Dominion Dealer Solutions and a leading provider of automotive data and software solutions,today released a case study detailing eOnWard’s use of DataOne’s VIN decoding and OEM Service Schedules products to increase dealership service appointments and revenue. DataOne Software, a division of Dominion Dealer Solutions and a leading provider of automotive data and software solutions, today released a case study detailing the advantages VIN Viper has gained from using DataOne’s VIN Decoding solutions.